Hop on a Whale Watching & Wildlife Tour with Angel Island Ferry. The San Francisco Bay is home to an abundant array of marine mammals and wild life. 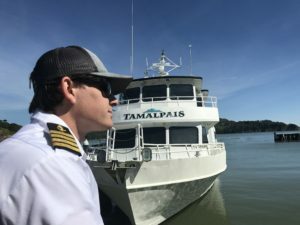 Join us aboard Angel Island -Tiburon Ferry’s luxury vessel “The Tamalpais,” as we journey under the Golden Gate Bridge in search of whale sightings and other marine mammals frequenting our San Francisco Bay. This 3 hour wildlife tour departs Tiburon, California, at 9:00 am on Saturdays starting June 15, 2019 – and runs Saturday mornings through September 28, 2019. Advanced reservations are required. No children under the age of 6 are allowed on this cruise. Please call (415) 435-2131 or email us at: aitferry@angelislandferry.com for further information. While we have been seeing whales this season, we can’t guarantee we’ll see whales at any given time. 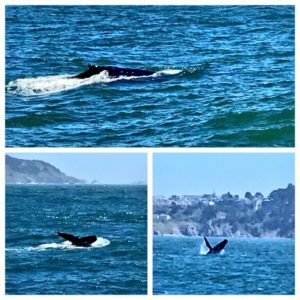 So if you don’t see a whale during an Angel Island Ferry Whale Watching Cruise take another Whale Watching Cruise on us this season.